The lackadaisical couple finally get their butts off the sofa once again and head to Gymboree @ Tanglin Mall. Yes, we were late again. We were late on Saturday music lesson and we were late yesterday. 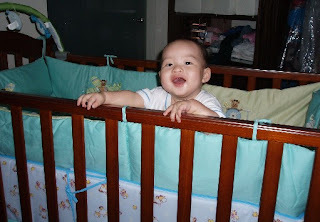 We were so lazy that we didn't bring any camera to capture Ziv having fun. But FORTUNATELY, I managed to get some pictures from one of the wonderful mommies, Phyllis whose daughter, Vanessa attended the same Gymboree II session as Ziv. Phyllis had brought her cutie-pie daughter, Vanessa to Gymboree for her first time trial. Unlike Ziv, Vanessa is jovial and amiable. I still remembered Ziv being uptight during his first session. Nevertheless, that uptightness feeling in him was gone yesterday! In fact, he was among one of the few babies who crawled towards the pool of balls to grab some balls! Adapted from a baby information website. Some of them really make sense. 16. You discover how much there is to say about one tooth. 17. You finally realize that true joy doesn't come from material wealth. 18. You now know where the sun comes from. 20.You realize that although sticky, lollipops have magical powers. 21. You don't mind going to bed at 9 p.m. on Friday night. 23. You realize that the 15 pounds you can't seem to get rid of are totally worth having. 24. You discover an inner strength you never thought you had. 25. You no longer rely on a clock — your baby now sets your schedule. 26. You give parents with a screaming child an 'I-know-the-feeling' look instead of a 'Can't-they-shut-him-up?' one. 27. Your dog — who used to be your 'baby' — becomes just a dog. 28. You take the time for one more hug and kiss even if it means you'll be late. 29. You learn that taking a shower is a luxury. 30. You realize that you can love a complete stranger. Procrastination is irresponsible. 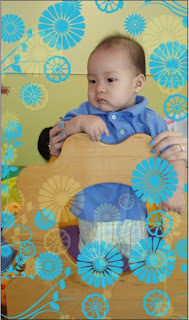 Kevin and I decided to put an end to our dalliance and enrolled Ziv to Gymboree. This was a promised made long ago to Ziv, way before Chinese Lunar New Year and no action since then. 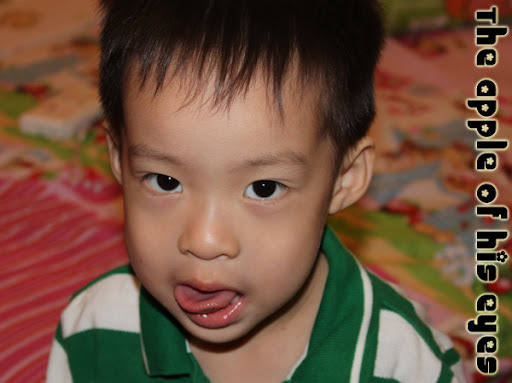 Kevin: Are you sure you wanna go Gymboree? HFMD, you know? Me: Yeah, wonder how safe are these places. Kevin: Are you going to hold responsibilities if he contacted HFMD? Nevertheless, this morning Ziv woke us up at <?xml:namespace prefix = st1 />10am and we gave Gymboree a buzz and within seconds, Ziv’s first lesson was fixed! 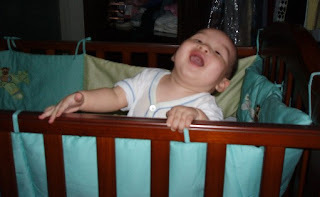 We didn’t opt for the trial lesson cause, we thought, so be it, just engage Ziv in some interactions with other babies will be good. Verdict? The first lesson was alright, some singing and physical activities. 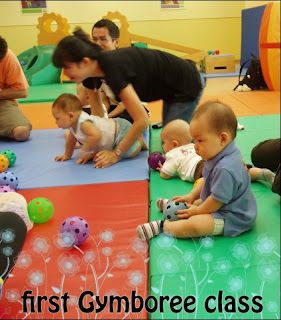 It allowed me to gauge the development of Ziv since, the class is mainly for infant between 6 to 9 months (Level 2). 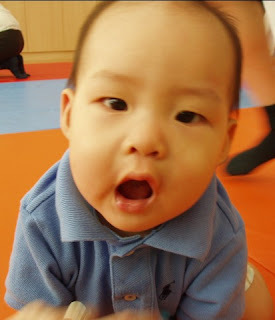 So far, Ziv can catch up with his ‘classmates’ since the consultant told us, it was better to enroll him when he is able to sit unsupported, stand with support and crawl for the Level 2 class. Of course, the courses do not come cheap. Membership alone already cost us $50 and the total cost for 12 lessons cost us a whopping $358! Not a lot of money, but to spend on some play group IS expensive. What to do? 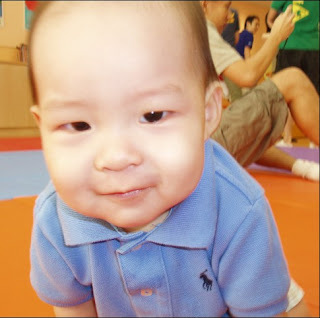 During certain part of the lesson, Ziv was chuckling and he was extremely chummy to his classmates and wanted to touch them. He was usually aloof and afraid of strangers. Digress a little, I had a rejuvenating spa on Saturday, everything seems so copacetic until I fish out my mobile phone and saw a sms by my boss it reminds me of the stress at work. Hate it. Recently I took a break from Ziv and strolled along Orchard Road. The queue outside Louis Vuitton seemed to scream, "FREE BAGS, FREE BAGS". It's hard to fathom the mentality of these people queuing. What's the big deal? You mean you queue and you only have to pay half the price of a bag? I walked to Chanel instead, which was just opposite of LV. And deeply regretted. Cause I found a new target in 'life'. A teeny wenny sized bag which cost $3500++. I stood in front of the mirror, having the coveted bag across my shoulder, I stared at my reflection, puffing up with pride. The bag was PERFECT! While I was imagining where I can go with the bag, a humdrum nagging interrupted my thoughts. Kevin. I say, If cars are the wives of these clueless men, then bags are the boyfriends of us women. The more the merrier! Ok, its sad to say that I am in my late twenties and still so childish. But I am frank enough to say that this is what I think, or else, why do people splurged on a $3000 bag, don't tell me they last longer? The quality? Complete nonsense! I am sure an Espirit bag can serve you as long as a LV. Nevertheless, who cares about Kevin's rambling, and I declared my new target to him. Its time perhaps to find a job that offers higher pay. As Rebecca Bloomwood (from Shopaholic series) once said something like this, "If you cannot minimized spending, then thrive to earn more money." Absolutely agree to that. Oh, its Saturday, hand me my RECRUITMENT papers please. It takes 6 years to build world's tallest skyscraper, Taipei 101. It takes 3 years to build the renowned Effiel Tower. Kevin surprised me with balloon bouquet which was sent to my office. It was humongous - 1.5m (to me) and I was bashful while I signed off for the bouquet. Prior to the day, he did mention that he bought something for me and he dropped a clue each day (for 5 days) for me to guess, and he was right, the gift was something super unexpected cause, he always tell me he won't-do-such-things. Kevin really sweep me off my feet this time. I was happy not because of the balloons, the attention, but Kevin did something which he will never do for me. It was much better than the T&C rings we bought.